After penning my last article on Love Art: Contemporary Art Fair, it seemed like a good opportunity to visit The Artist Project to offer a review and some of my personal highlights. Unlike Art Toronto and Love Art, but like its sister project- The One of a Kind Show– The Artist Project offers potential patrons a chance to meet the artists themselves, who are generally present in their booths. The pamphlet for the show boasts work from over “250 top contemporary artists,” which can be a bit of an overwhelming undertaking for the viewer- especially if one is contemplating making a purchase. I’d argue slightly with the semantics of the pamphlet’s proclamation. There is a fantastic selection of contemporary work, and always an interesting selection of curated concept works dotting the periphery of the artist booths. That said, much of the work exhibited is contemporary only in the fact that it is being produced at this time, rather than being contemporary in aesthetic. Not really a bad thing, as it offers viewers a wide range of offerings that must appeal to many different consumer palates. I’d argue with this aforementioned statement on another level as well- and that is describing the participants as the “top” artists. I wish I had been present for Leah Sandal’s panel discussion with various artists in their discussion of “Success as an Artist,” which was one of the five chats offered over the course of the show. This capacious topic can only be touched upon after defining the kind of success the artist is seeking to obtain. At this show, the viewer will find many career-artists who have refined their skills in a particular medium and particular style. While their work is definitely worth the prices they are charging in terms of skill and effort, they are not all the kind of “top” artists that one would purchase if the piece is going to be considered an investment rather than an item procured for the purposes of loving and beholding. The show is a fantastic way to see a cross-section of practicing artists, and possibly to discover either an emerging artist who may be the art-world’s “next big thing” or an artist whose work you will feel honoured to support and have in your home. Here are a few of my favourites from this year’s show. In the emerging section, Bryan Belanger’s high-resolution photo collages feature endangered animals that have been created with images of ornate filigree jewellery and other precious material- think Arcimboldo but more precious and high-tech. The work is quite stunning as it is meticulously produced. The artist is unapologetic about the simplicity of his work’s metaphor and donates 25% of his proceeds to the WWF. 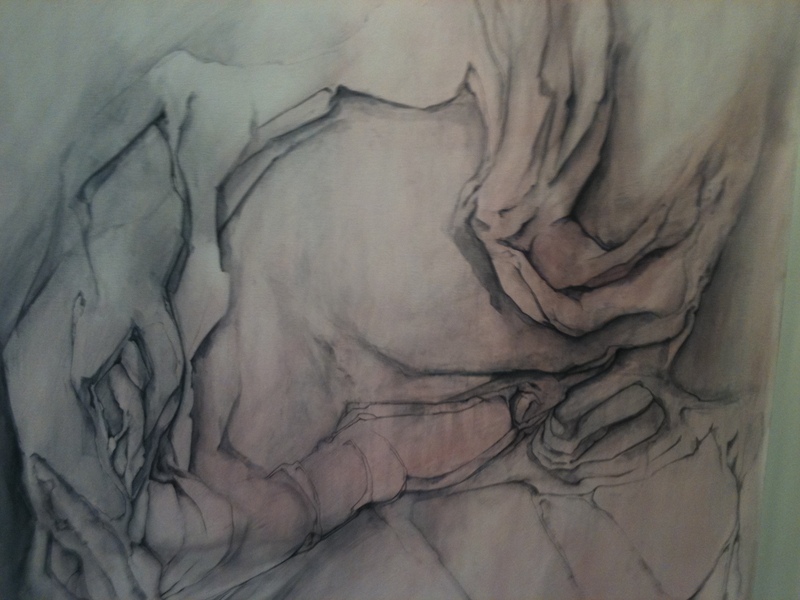 Also in the emerging section was the work of Alex Curci. Apparently arising from extensive sketching, these automatic-looking acrylic works come from a process of building-up and removing to create a webby gauze of paint describing the artist’s musings on the hidden back end avenues of technological infrastructure. Laird Kay is a photographer who was particularly interested in architectural spaces until the ever evolving lego work created by his partner’s nervous hands seduced him into a playful documentation. 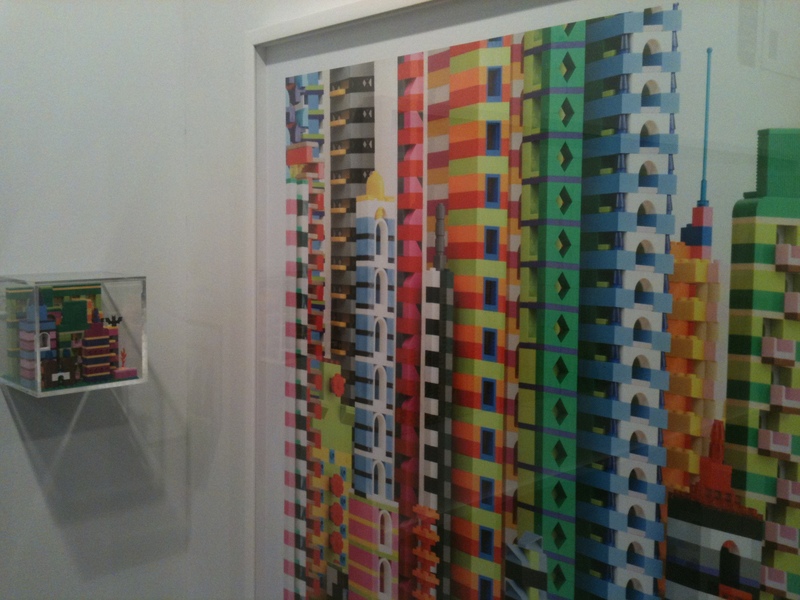 The full-scale photograph of the “lego-city,” which spans the length of their basement, is shot on a completely flat white background giving the entire piece the illusion of being a print rather than a photograph. Detail shots highlight the intense candy colours of the toys or seek to create further illusion by being shot from with a wet lens. I’d love this artist to visit the AGO and peruse the work of Kim Adams, and then the rest of us can sit back and home for further conceptual developments in these chronicles. I will make an admission here: I have a terrible fear of horses. My grandfather was a cow-boy (literally, he rode saddle-bronc in the Calgary Stampede). Growing up in the city, I was exposed to horses with the heavy doses of caution that comes from those familiar with them- but not given any exposure to their supposed finer qualities. For years I feared if I rode them they would bite me, and of course when I finally did, I ended up with a huge blue-purple welt to offer as temporary proof for my fears. But I digress. I mention this because I find it hard to walk by “horse-art” without making note, and I must be very careful not to applaud it all. All that said, I believe the work of American Dana Filibert stands out. In a light-hearted critique of the American auto-industry’s obsession with horse-power, she has created a series of 3D collages fashioned from steel hemispheres, found objects, high-density foam and a 2 part epoxy she learned to use while restoring dinosaur fossils. The pieces are then sprayed in thick layers of auto paint. 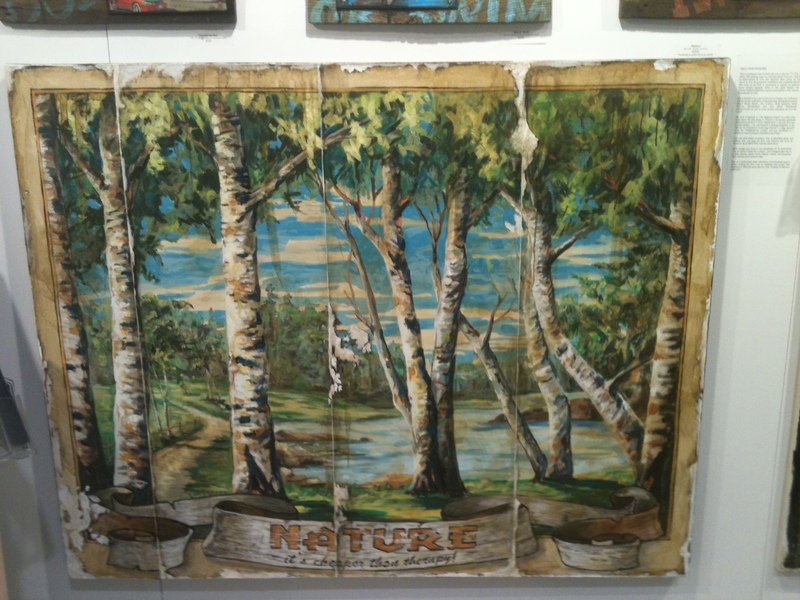 If you’ve done the art/craft-show circuit, you’ve likely seen the work of Richard Ahnert. His oil paintings generally feature archetypal human figures anthropomorphized with animal heads. Part of me wants to criticize the work as a bit too hip or predictable, but the unarguable skill of Ahnert’s painting style combined with his actual choices of human/animal combinations makes me hesitant to do so. Also, the frames on this work are beautiful and often in keeping with the theme of the particular painting. It’s very easy to see how his work sells as well as it does. Jesse Bromm is currently completing a residency at the Harbourfront Centre in their glass studio. 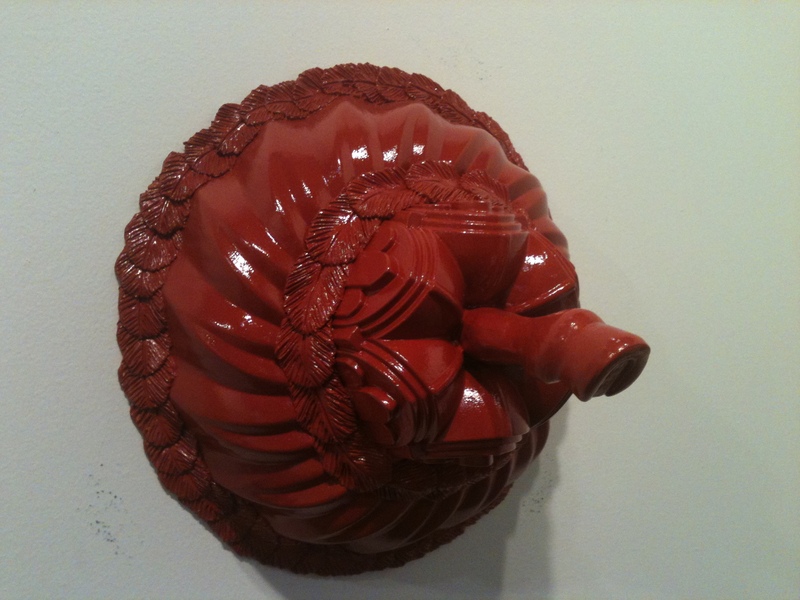 His work is a fine example of what the show has to offer in the area of contemporary material art. Working extensively with well-placed railway figurines, his work addresses “what’s under the surface” of society- in terms of dirt, death, and taboo. The body of work at the show presented by Quebec “sculpteure” Claudia Cote was largely completed on a residency to the Banff Arts Centre provided to her by the Quebec council for the arts. 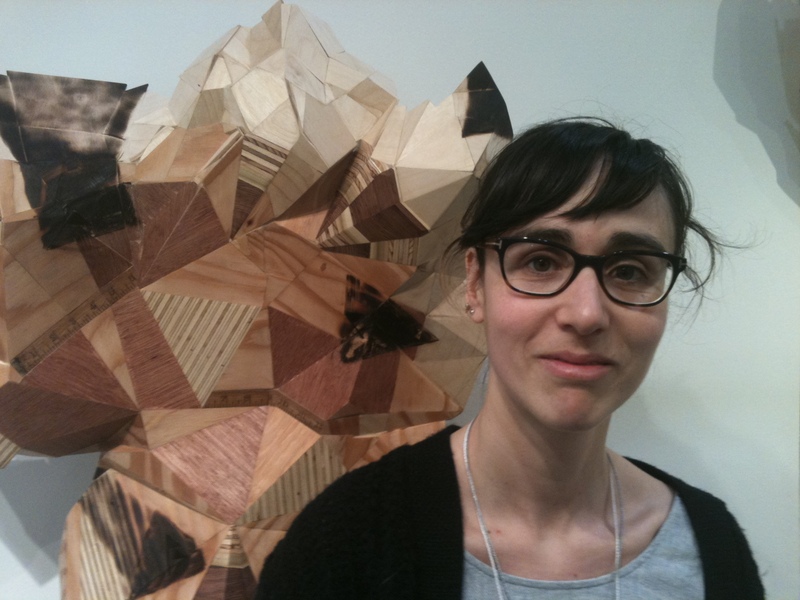 Cote uses wood and traditional wood-working techniques to create highly untraditional and often geometric (mountain-inspired) forms examining native traditions and identity. During this residency Cote made some of her own plywood which she then filed away to play with the colours she found so inspiring in the mountains. I want to describe Elaine Chan-Dow’s large format interiors crosses between Robert Polidori’s opulent Versaille’s work and Andreas Gursky’s architectural abstractions. Her documentaries of literary spaces were a featured exhibition in last year’s International Festival of Authors, and is also a featured exhibition at this year’s Contact Festival at IX Gallery from April 25-May 30 this year. I’m super excited (yes, I just said super excited) about the caliber of her work. 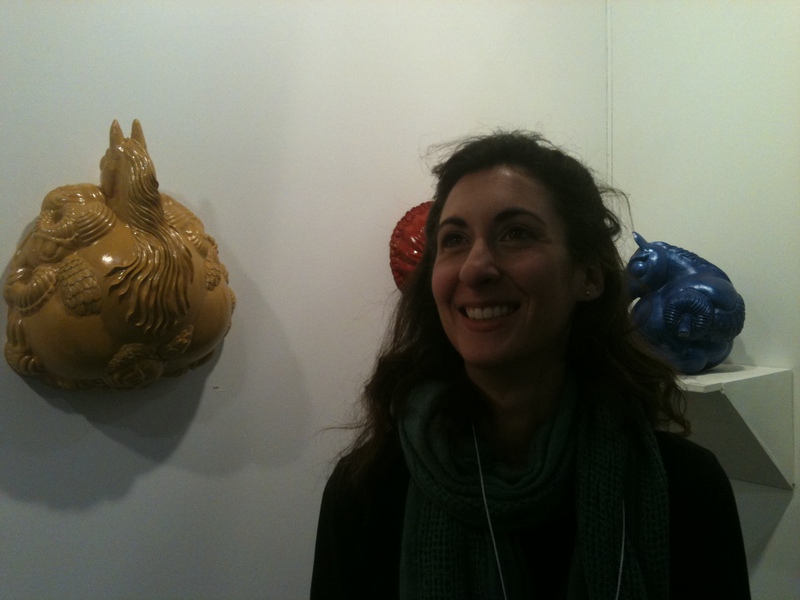 She’s an example of the kind of up-and-comer you might discover at this show. Let’s hope she’ll grant me an interview so we can hear more about her in the spring. I met Stewart Jones and Rob Croxford while preparing for a Canadian Art Gallery hop tour I was leading down Ossington a few years ago. Jones’ Toronto landscapes are heavily based in his street-level meditations of light, shadow, and patterns created through the detritus of lines floating in our urban sky. Keep up with his regular shows done with in participation with the landscape painting collectives he is a part of: CityFieldNorthShore and CanadianArtCollective, and check out this earlier post about his work. 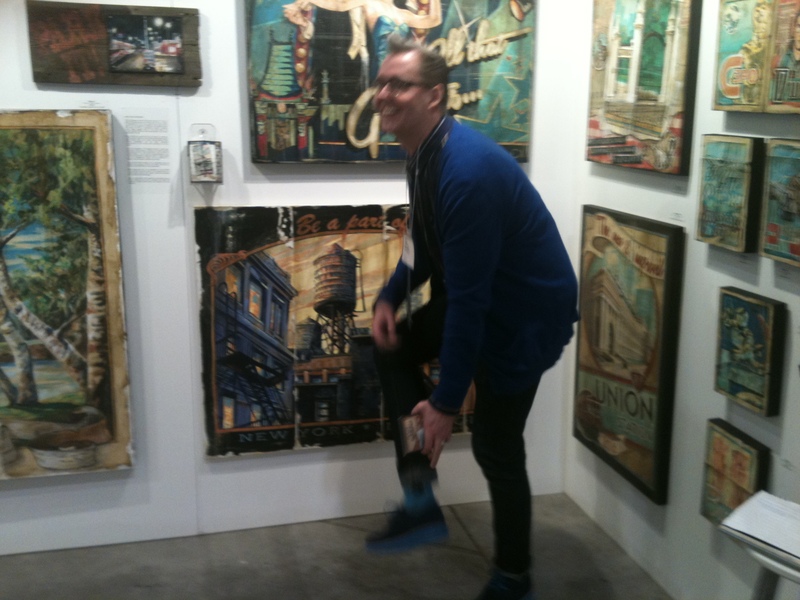 Don’t step on Rob Croxford’s shoes! I want you to pay attention to Croxford’s shoes in this photo. The sole is a vibrant turquoise and for this reason they are of special mention. Croxford has perfected a light-hearted and funny retro aesthetic once confined to toys and video-games, which now includes darkly faded urban landscapes and birch forests. Don’t be afraid to talk to this highly personable artist at one of his regular shows, for more information check out this earlier post about his work.